If you are wondering what kind of pot this is, it is a clay pot, called gyuveche, from my home country Bulgaria. This pot was a present from my Mom for me and my husband’s first anniversary. She also gave me the recipe for this meal. 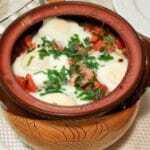 Some traditional Bulgarian meals are made in clay pots and they define the country’s Old World’s cooking practices. This cooking method enables full exposure of flavors and it further keeps the nutritious content of foods intact. If you ever visit Bulgaria, don’t miss the chance to visit a souvenir shop where you will find unique and beautifully hand-painted pottery, as well as textiles and hand-carved wooden accessories, and many more collectible pieces. Pots, trays, bake dishes, casserole dishes, plates, mugs, pitchers, you name it… You will find many pottery pieces in different styles and color patterns. A collector’s dream come true. Bulgarian pottery is great for gifts or to take back home as a souvenir which can be used as a decoration piece, for cooking in the kitchen or both. This is an article about the beauty of the Bulgarian ceramics. If you are not planning a trip to the beautiful country of Bulgaria in the near future, but are in love with the pottery, BulgarUSA offers some unique and beautiful pieces. 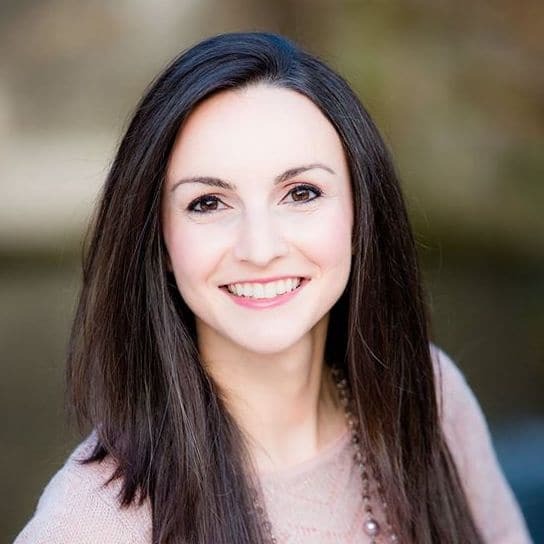 I am not affiliated with this company and don’t receive any commission for my referral. Gyuveche. 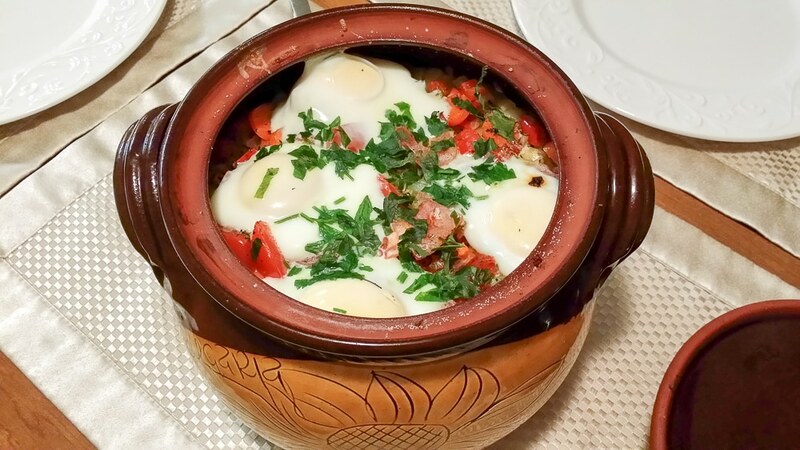 It is a traditional Bulgarian meal whose name is derived from the ceramic pot in which it is baked and served. It is very easy to prepare and tastes wonderful. You just need to wash and cut the vegetables, arrange them and the beef in the pot and bake for 30 minutes. This is also a great recipe you can use for weeknight meals. Just prep the veggies the night before, brown the meat and refrigerate. The next day after you get home from work, arrange the vegetables and meat in the pot and put in the oven. Within 40 minutes you will have a warm, delicious supper prepared with unprocessed food. I haven’t tried this, but probably you could use a Dutch oven if you don’t have a clay pot. 1. Brown ground beef and season with salt and pepper. 2. While browning beef, arrange half of sliced potatoes at the bottom of the pot. 3. Sprinkle half of chopped carrots, celery, red bell pepper, tomato and onion over the potatoes. Season with salt, pepper, paprika and chubritsa. 5. Add another layer of potatoes, carrots, celery, red bell pepper, tomato and onion. Season with salt, pepper, paprika and chubritsa. 8. Carefully take the pot out of the oven and crack four eggs on top of the vegetables. 9. Bake for another 10 min until the eggs are set. 10. Season to taste and serve with chopped parsley. * Don’t preheat the oven. Placing the pot in a hot oven may cause it to crack or break. Cook for 30 minutes from the time the oven reaches 450 F.
Brown ground beef and season with salt and pepper. While browning beef, arrange half of sliced potatoes at the bottom of the pot. Sprinkle half of chopped carrots, celery, red bell pepper, tomato and onion over the potatoes. Season with salt, pepper, paprika and chubritsa. Add another layer of potatoes, carrots, celery, red bell pepper, tomato and onion. Season with salt, pepper, paprika and chubritsa. Cover with lid and bake at 450 F for about 30 min. Carefully take the pot out of the oven and crack four eggs on top of the vegetables. Bake for another 10 min until the eggs are set. I popped over as soon as I saw your comment on my blog about Bulgarian food! I wanted to see what you had shared. This looks fantastic! I love that it’s something a little different BUT YET it is made with ingredients I am familiar with! YUM YUM!! Hi, I’ve just moved to Bulgaria and today I’ve bought my first gyuveche! I’m thrilled to see your recipe and am on the lookout for more traditional food to cook in my beautiful pot. Thank you. Wow, that’s fabulous! Hope you enjoy this meal! It’s so cozy & comforting – perfect for this time of the year! How do you clean a clay cooking pot? Can you use soap and water? Yes, i use soap and water in mine. Mine has a glaze on it. Not sure if yours is the same. If not, I would follow the instructions that came with the clay pot.